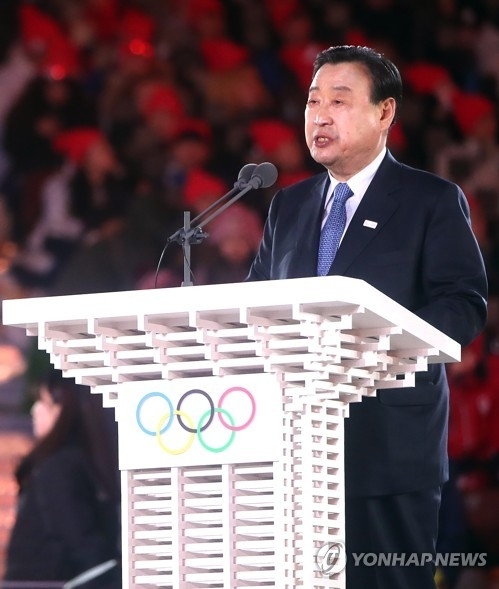 PYEONGCHANG, South Korea, Feb. 25 (Yonhap) -- The PyeongChang Winter Olympics brought the world together "in peace and harmony," the event's top organizer said during the closing ceremony on Sunday. "In PyeongChang, the world became one," said Lee Hee-beom, head of the PyeongChang Organizing Committee for the 2018 Olympic Winter Games (POCOG), during the ceremony at PyeongChang Olympic Stadium. "Transcending the differences of race, religion, nation and gender, we smiled together, cried together, and shared friendship together. Even though we are now saying goodbye to each other, PyeongChang 2018 will be long remembered with beautiful and unforgettable memories." Lee pointed to athletes from South and North Korea in particular, as they marched in together behind the Korean Unification Flag during the opening ceremony and agreed to form a unified women's hockey team. Lee said these acts "showcased much bigger possibilities beyond sport." "When marching together, and even competing together as a unified Korean team, it constituted a strong identity of one single nation," Lee said. "The world paid its high tribute of admiration for the athletes of South and North Korea, who marched and competed together during the games." Lee had long pushed the vision of holding a "Peace Olympics" in PyeongChang, and he said the presence of both Koreas at these Olympic Games has laid a solid foundation for the future of the two Koreas. "The seed of peace you have planted here in PyeongChang will grow as a big tree in the not-distant future," he said. "The hope and aspirations of South and North Korean athletes together with cheerleaders will definitely serve as a cornerstone of the unification of the Korean Peninsula." Lee saluted all the athletes as "true winners," and thanked PyeongChang residents, POCOG staff members, volunteers and other Olympic partners as "patriots and heroes."